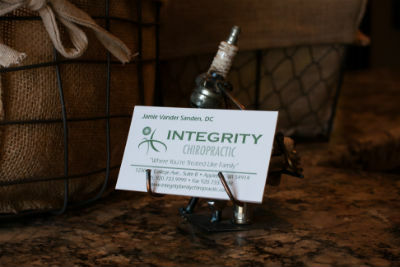 Dr. Vander Sanden established Integrity Chiropractic in 2008, with the goal of Integrity Chiropractic of ensuring that her patients get better and are treated like family. She chose Appleton because she’s from the area and has many family members in the near by towns. Integrity Chiropractic is committed to serving the families of the Appleton community by providing quality chiropractic care. We are dedicated to optimizing health and wellness through specific analysis of the spine and removal of nerve interference, allowing the body to function at its peak potential. Chiropractic is all about restoring health and healing in the body. At Integrity Chiropractic, the focus is on helping your body heal naturally, just as you were designed to. We emphasize the importance of improving your health in an effort to reduce the risk of pain and illness in the first place, so that you’re able to live a pain-free life. Dr. Vander Sanden uses chiropractic care to improve health and wellness in all areas of your life… whether you’re having aches and pains, or just want to start feeling better when you wake up in the morning. She is passionate about caring for expectant mothers and children, but looks forward to helping every member of your family! Take the first step towards relief. Contact us today to make an appointment to discuss your health goals.